Give your grill a makeover with GrillGrate interlocking panels that fit over any grill surface to amplify heat, even out hot/cold spots and reduce flare-ups. GrillGrates replace your existing grates or simply cover them. Use one set to cover part of your grill, or connect multiple panels together to cover more surface area. Made from hard anodized aluminum, GrillGrates offer more efficient heat conductivity compared to cast iron or steel, delivering fast, even cooking and perfect sear lines. Hard anodized aluminum is rust resistant, extremely durable and also able to withstand heat up to 1,000 degrees Fahrenheit. The underside pattern blocks flare-ups, preventing food from charring or drying out. Juices and drippings from your food fall into the hot valleys between the grates, sizzling and steaming into flavor. 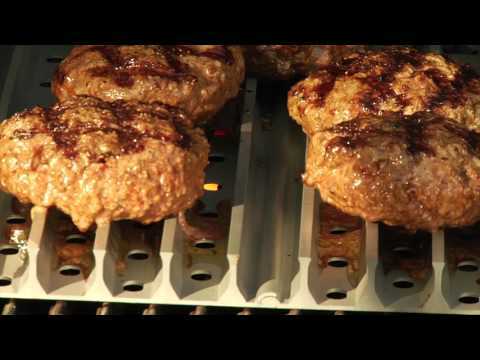 The fat drains off and burns in the bottom of the grill grate and not on the outside of your food. The GrateTool prongs fit between and below the rails to lift not scrape food on the grill and also doubles as a cleaning tool to clear the valleys of build-up. This grill surface set includes two 5 1/4 W X 20 D (10 1/2-inch total width) interlocking GrillGrate panels, grate tool, user guide and recipe booklet. GrillGrate products are made in the USA. Thanks so much for contacting us. Here is a link to the grates that are made for the Weber Genesis www.bbqguys.com/bbq-accessories/grillgrate-surface-kits There is a 2 panel and a 5 panel. I hope this helps. Please let us know if you have any other questions. 20" 17 3/8" 18 1/2" 18"